This piece was installed in the Maxine Merlino Gallery at California State University, Long Beach. Branch-like forms move subtly, fading in and out almost imperceptibly, as sounds of wind and breathing undulate in the background. A mysterious object is suspended in the center of the wall, and is revealed as the video fades to white. 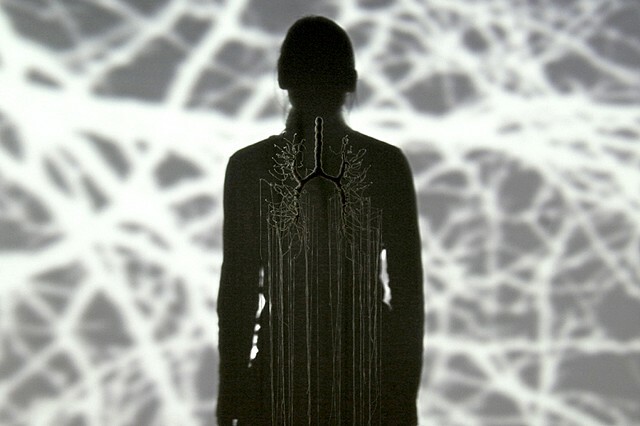 The viewer has the opportunity to align their shadow with this object, a pair of lungs constructed using fibrous materials, thus positioning themselves simultaneously within the body and within the landscape. Notions of the body, time and memory are alluded to within the work. Breath(e) is an exploration of the 'permeable boundary' that exists between our physical bodies and the world around us. There is a literal exchange that occurs within every inhale and every exhale. This exchange, subliminal and subtle, happens beneath the surface. It is background, peripheral, like the passing of a breeze through branches. Yet it is this exchange that fuels us. When we are without it, we are without breath, without life. Metaphorically, the act of breathing speaks to the continuous dialog, the ongoing give and take that occurs in each person's life. As we daily leave our marks in the world, the world leaves its marks upon us. I am interested in the way these interactions are absorbed through the body, leaving their residue within our memory.